The logo concept materialized out of two workshops at our studio with Third Angle New Music’s staff and marketing committee. The first workshop explored Third Angle’s core attributes, mission, aspirations and value to the community. At the second workshop each participant was asked to pull 5 favorites from a wall of inspirational images and to explain why their selections were meaningful and relevant to Third Angle. From these exercises emerged a logo concept that represents the intersection of new music, composition and collaboration across the dimensions of style, time and space. The logo design is based on overlaying the name Third Angle on a three dimensional tetrahedron grid. This folded topographic plane of triangles is inspired by the facade of one of the Chinese pavilions at the Shanghai World Expo that I saw during Third Angle’s first trip to China for the Beijing International Music Festival. Third Angle’s story and history is embedded in the new logo. Original artwork was created using a piece of paper printed with the words Third Angle that was then folded and photographed, again and again. A final digital version emerged that met the range of application demands. A brand statement, tagline and graphic application standards were developed to bring the new identity to life. Michael Reed serves on Third Angle’s Board of Directors. 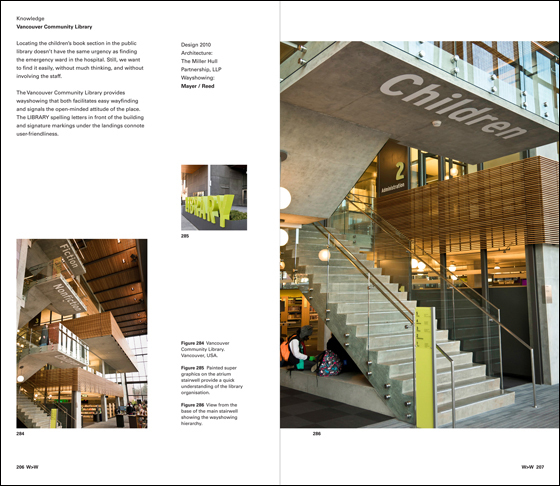 We are honored to have two projects featured in a new book by Per Mollerup, Wayshowing>Wayfinding: Basic & Interactive. 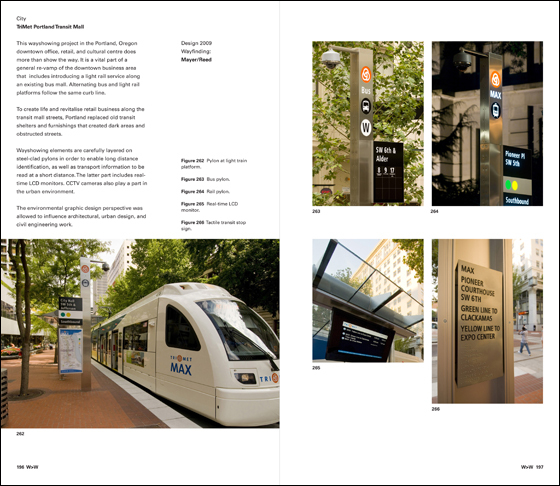 The firm’s visual communications work for Tri-Met Portland Transit Mall and the Vancouver Community Library are featured as examples of successful wayshowing from around the world. The book is a follow-up to the 2005 edition, Wayshowing: A Guide to Environmental Signage which also featured Mayer/Reed’s work. Per Mollerup is Professor of Communication Design at Swinburne University of Technology, Melbourne and author of several books on design. Landscape architects at Mayer/Reed volunteered “hands on” time last week, applying elbow grease into pruning shrubs and trees of the two courtyards at Bud Clark Commons, a non-profit center providing services to the homeless. The Day Center and Men’s Shelter courtyards get intensive use everyday. While we don’t normally maintain the landscapes that we’ve designed, returning to sites after installation is time well spent to see if the spaces are being used in all the ways we anticipated. 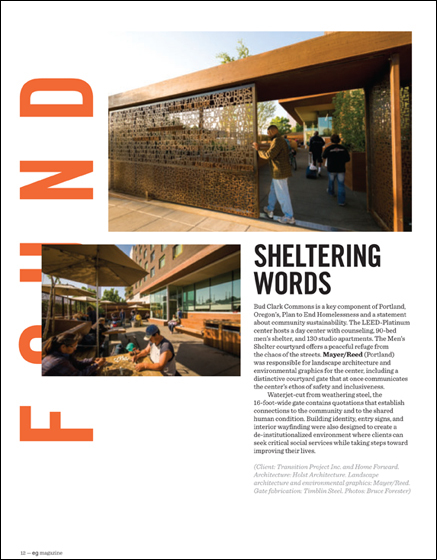 The Bud Clark Commons courtyard gate is featured in the current edition of eg, the award-winning magazine focusing on visual communications in the built environment. 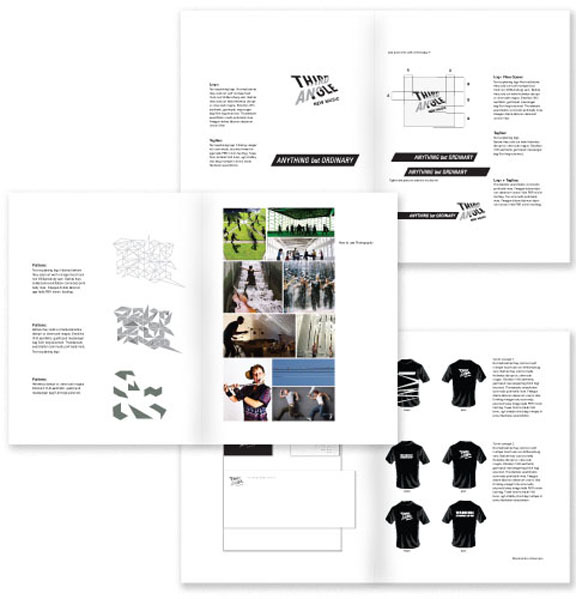 The magazine is published quarterly by the Society for Experiential Graphic Design (SEGD). “Mayer/Reed was responsible for landscape architecture and environmental graphics for the center, including a distinctive courtyard gate that at once communicates the center’s ethos of safety and inclusiveness.